Each spring arrives with the potential of renewal in the air, the soil, and our hearts. It is a season of renewal and rebirth. It is a time when the earth begs for new seeds to be planted. On March 20 we experienced the Spring Equinox. Equinox comes from Latin and means “equality of night and day”. It is a day when the sun moves north across the equator. During the Spring Equinox we have a day that is as long as the night. The Equinox ushers in the seasonal transition from winter to spring. The winter season brought us closer to the hearth and closer to our heart. Part of us hunkers down into a quieter and more still life as the cold blows outside and the days bring more darkness. The winter offers us a time of introspection and of dreaming. It is in the winter where we move more inwardly. Just as the hibernating bear prepares in the summer and fall for the long quiet weeks of darkness and sleep, we too have the opportunity to follow nature’s way and begin to consciously reflect upon our life, our dreams, our values, and our vision for who we are becoming. It is in these quiet, reflective and dreaming months of winter that we have the opportunity to develop the spiritual seeds of our life that will bloom come spring and summer. Like winter the spring brings its own set of changes in nature and offers us a window into wisdom on how we might renew and rebirth our ideas, our relationships, our home, our spirituality and our vision of ourselves and how we want to create our self, our life and our future in this new year. Mother Earth is a grand teacher and when we begin to pay attention there is great wisdom to be gleaned. These seasonal changes are important to those who have developed a spiritual framework of themselves and the world. There is a sacred power in the earth and by simply observing and feeling the changes of the season we are privy to this sacred empowering wisdom. The changes are not only happening in nature, but within us and can teach us how to renew ourselves and plant out intentional seeds in the spring, how to play in the summer, how to harvest our own seed plantings we’ve planted and tended in our life in the fall and how to rest, reflect and dream in the winter. Nature will offer us wisdom and ways for how we might best direct our own efforts in our life throughout the year. Our Mother Earth is a grand teacher and when we begin to pay attention there is great wisdom to be gleaned. It is spring and the time is here to discover what our seeds are, what condition our soil is in and to plant our seeds for the future in clear, weed-free earth! These are your seeds and when prepared and planted in clear soil will soak in the sunlight and be nurtured by our self and by the Divine both in our gardens and in our heart and soul. Offered here are seven ways to begin your own inner spring cleaning for planting your seeds! Spring cleaning requires that we roll up our sleeves and get in the dirt! 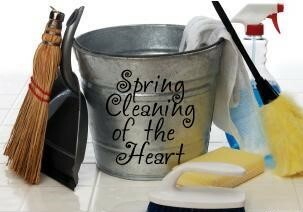 Spring cleaning is different than cleaning up the dust of every day. Its when you move things around, mop underneath, drag your rag up high over shelves, fan blades, door jams and window panes. Spring naturally beckons us to get outside, get moving, and allow the beauty of the newness of spring enter everywhere in your life. Step One: Spend time reflecting on your dreams and larger visions of yourself and your life. When you have an idea of what these are make a list of the top five. For each of your dreams/visions identify the feeling each one gives you. Also identify why it is important to you and why you value you this for your life. These are your seeds. Step Two: Use an index card, poster board, paper or card stock and write the dreams/larger visions on it and post it somewhere that you will see it and run into it often throughout your day and coming weeks. You can decorate a boarder around the card or not. Its up to you. The seed is a powerful symbol and reminds us that the small dreams, hopes and visions and big dreams, hopes and visions can become beautiful and bountiful! Seeds hold the blueprint of your potentials! Planting seeds requires action. Spring beckons you to take action towards accomplishing the planting of your seeds with the expectancy of your seed’s blooms. Take action with your dreams and visions one at a time. Take the first one on your list and decide upon the first three steps that you will take to bring this into manifestation in your life. Then take those three steps! Keep going…and then…keep going! The soil we plant our seeds is makes all the difference. If you plant your seeds in clay they will not grow. If you plant your seeds in bone dry soil they will not grow. If you plant your seeds in weed overrun soil your seeds will struggle to survive. Task One: Clean, weed, clear out the objects and overstuffed closets and drawers in your home. Purge items you are no longer interested in and give away items that you no longer want as gifts and include a note of appreciation of the person you are giving it to. Donate what you no longer want to a worthy cause you love and or believe in. A dream and vision will blossom where there is room for it to grow. Soon you will begin to see who you are now and what you now really value that might have been hidden under the 8 pairs of sneakers that you never wear or that collection of unread books on your bedside table! Step Two: For each square you will identify one thing (situation, emotion, habitual thinking habit, one fear, a struggle, a personality trait, lack of clarity, lack of motivation…etc.) Write each on its own piece of paper. Step Three: When this task is complete hold each piece of paper one at a time in your hand and identify the emotions you have connected to the thing you are letting go. Step Four: Blow all the feeling and energy of this issue you are releasing into the paper. Step Five: The last step you will take is to burn each piece of paper one at a time after you identify the emotions you have around the issue and have blown those feelings into the paper. State that your release it as it burns gently in a fire proof container. This is the cleansing ritual of releasing that which no longer serves you. In this ceremony you are releasing both mentally and energetically through your mind’s identification and awareness of the issues and energetically through the identifying of the emotions and releasing these through the breath. Now that you have cleared out the clutter and allowed space to be created within you and your home it’s time to revive your space. -make it fun, be creative, this is a reviving, a breathing in new light and breath to feed your seeds! What do you want to be doing more of or less of in your life? To innovate your life begin doing more of what you value. By filling our days with activities that reflect our values we find deeper meaning and satisfaction. Remember, as spring arrives, to walk in nature to listen and watch to what Mother Earth, the trees, the flowers and animals are doing. They, too, are in the process of renewing and planting seeds. You are connected to them and you are in this natural and organic rhythm of earth. When you step into the process of spring you open to the path of reaching a higher potential within you!